A Woven Dream for Feargus, 2010, acrylic on canvas, 80x60cms. PRIVATE COLLECTION. Black Swan Patch, 2010, acrylic on canvas, 160x130cms. PRIVATE COLLECTION. Still Like When a Pin Drops, 2010, acrylic on canvas, 56x46cms. PRIVATE COLLECTION. No Such Dignity, 2010, acrylic on canvas, 56x46cms. PRIVATE COLLECTION. 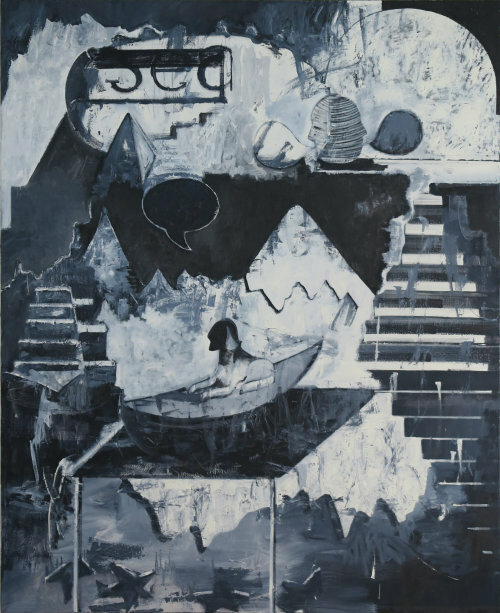 Tragedy at the Dwelling, 2011, acrylic on canvas, 75x60cm. PRIVATE COLLECTION.